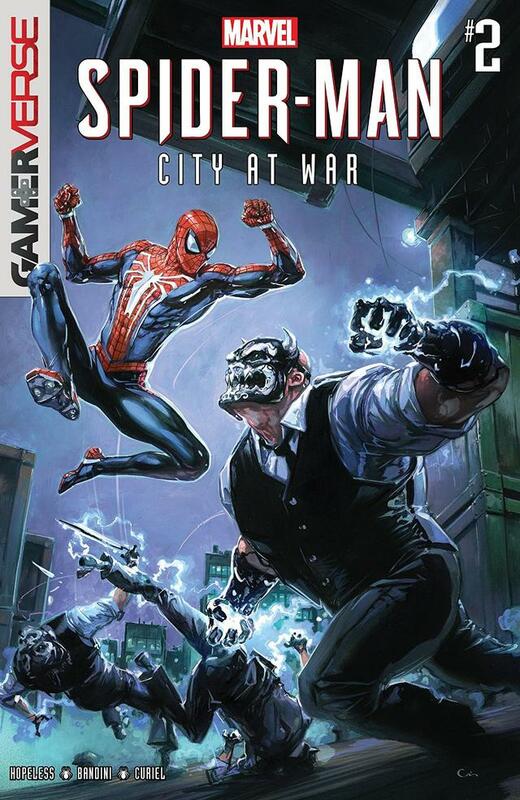 Last month, Marvel released the first issue of MARVEL’S SPIDER-MAN: CITY AT WAR #1 by Dennis "Hopeless" Hallum and artist Michele Bandini, a comic adaptation of the Spider-Man story featured in “Marvel’s Spider-Man” for PlayStation 4. The game was released last fall, to acclaim from both fans and critics. Now, Hallum and Bandini are remixing the story and adding in a few moments that expand upon the world of the game. To bring everyone up to speed for MARVEL’S SPIDER-MAN: CITY AT WAR #2, on sale Wednesday, April 17, here is a rundown on the hit video game’s story without spoiling some of its biggest surprises. By the time “Marvel’s Spider-Man” begins, Peter Parker has been a Super Hero for eight years. He’s a very experienced hero at this point, but he hasn’t quite figured out how to maintain his personal life without Spidey stuff getting in the way. It’s telling that in the very first scene of the comic and the game, Peter ignores a pending bill in order to take down a longtime foe. Two of Spider-Man’s greatest enemies are in the game, but not in the way you might expect. Norman Osborn is the overbearing mayor of New York, while Otto Octavius is Peter’s mentor and employer. There are several nods to their respective alter egos, the Green Goblin and Doctor Octopus. But their relationship with Peter is very different in this world. In fact, Osborn and Octavius’ animosity is largely reserved for each other. Mary Jane Watson’s romantic relationship with Peter Parker is a thing of the past, but they are still very much in each other’s lives. In this incarnation, Mary Jane is a star reporter for The Daily Bugle and a fearless investigator. She throws herself into danger regardless of whether Peter is around to save her. That’s one of the reasons her connection with Peter is so strained. While Aunt May’s connection to Martin Li’s F.E.A.S.T. shelter is straight from the original comics, the game’s writers strengthened Peter’s ties to Li as well. Now, Peter is an active volunteer at F.E.A.S.T. when he’s not trying to save the world as Spidey or change the world with Octavius. Although J. Jonah Jameson never physically appears in the game, he has a constant presence as the host of the “Just the Facts” radio show. While Jameson was once The Daily Bugle’s publisher, the show is now his main outlet to reach listeners across the city. JJJ may be a great reporter, but his anti-Spider-Man bias brings a lot of unintentional comedy to the table. He hates Spidey so much that he finds a reason to blame him for everything, no matter how trivial. Harry Osborn is one of Peter and Mary Jane’s best friends in the game, even though he’s largely absent from the narrative. His impact on Peter’s life can be felt in several of the game’s side missions. However, the comic may give Hallum and Bandini a chance to further explore that personal connection. Another departure for this game is the inclusion of Miles Morales, the new teenage Spider-Man in the comics. 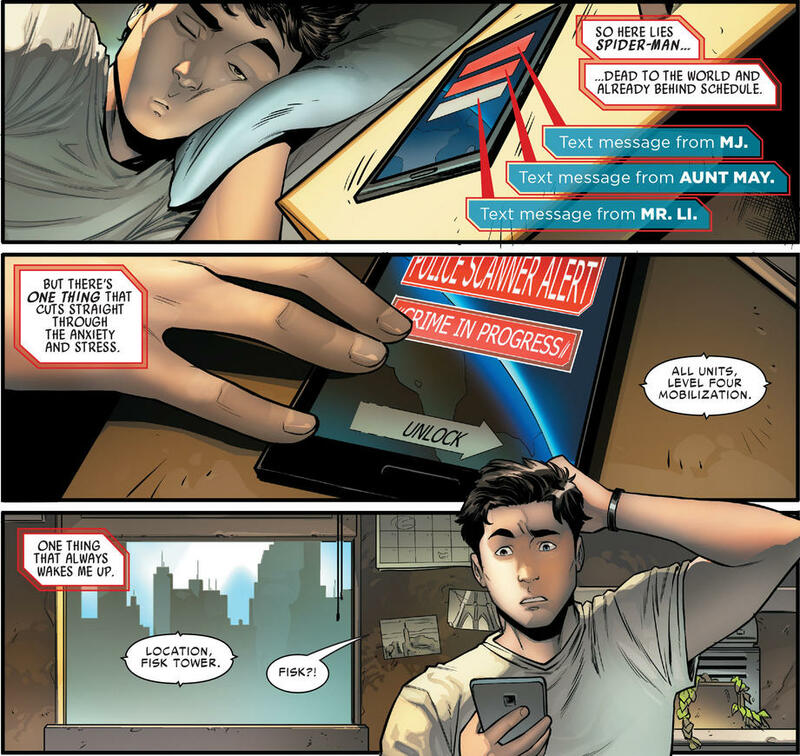 In this universe, Miles is noticeably older than his comics counterpart and only a few years younger than Peter. He’s also a big fan of Spider-Man, who has his own role to play. 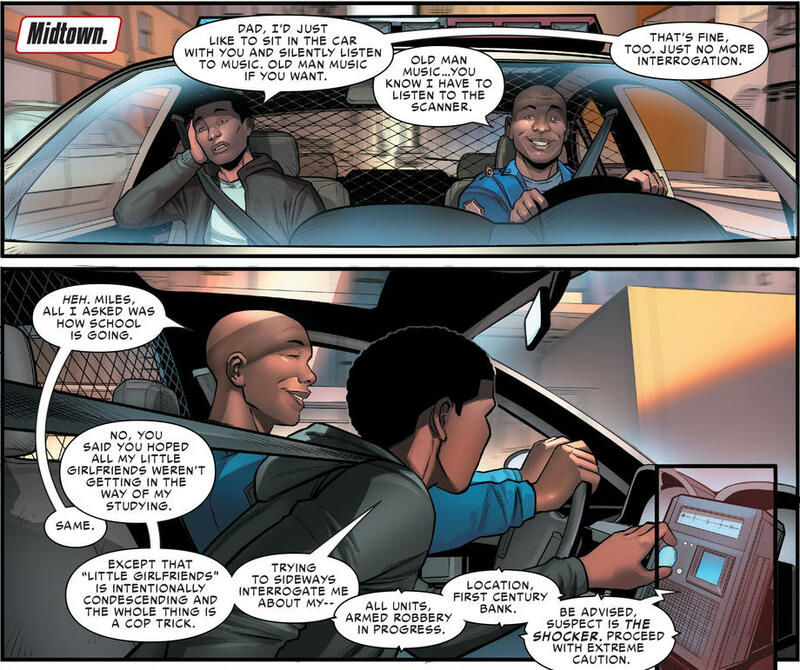 The first issue of the comic already offered a new look at Miles’ relationship with his father, Jefferson Davis. Incidentally, Jefferson is another key character that fans should keep their eyes on – he’s got a big part to play as well. The Peter Parker of this world has already made his comic book debut. 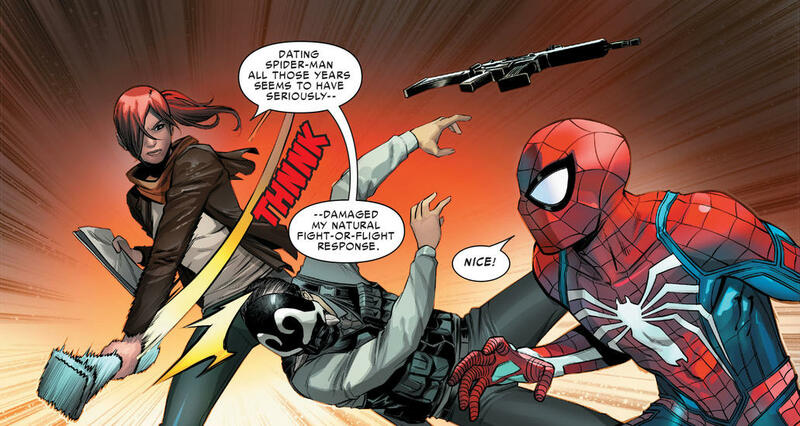 In SPIDER-GEDDON, Peter was recruited by the Superior Spider-Man in a desperate struggle against the Inheritors. Now, the door is open for this Peter to eventually reunite with the other Spider-Men and Spider-Women. MARVEL’S SPIDER-MAN: CITY AT WAR #1, written by Dennis “Hopeless” Hallum with art by Michele Bandini, is on sale now online and at your local comic shop. You can also pre-order your copy of MARVEL’S SPIDER-MAN: CITY AT WAR #2, out Wednesday, April 17, today!